The game of golf in China is gaining popularity in leaps and bounds, and like anything else, when the Chinese take a liking to something they quickly make it their own, so don’t be surprised to find Chinese professional golfers ranking among the best in World Cup of Golf events in years to come. At 216 holes, the Mission Hills Golf Club, outside the city of Shenzhen, China, is rated by the Guinness Book of Records as the world’s largest golf club. By itself, that claim to fame doesn’t mean very much, but a look at the list of designers of various 18 holes sections of the course will tell you that this is an exceptional club by anyone’s standards. Here are a few names attached to Mission Hills various tracks: Jack Nicklaus, Greg Norman, Annika Sorenstam, Ernie Els, Vijay Singh, Nick Faldo, Jose Maria Olazabal, David Daval, Jumbo Ozaki, and David Leadbetter. Located in the tropical area at the Southern region of China, Hainan Island is warm all year round and has no true winter weather making it an ideal year round golf vacation destination. This lovely island boasts soft beaches and beautiful tropical scenery, making it a famous holiday resort in China. Mission Hills Haikou currently has ten 18-hole championship golf courses designed by Schmidt-Curley Design. Drawing inspiration from iconic international designs, the courses are perched on a bed of ancient lava rock, highlighting the area’s volcanic origins and creating a truly unique golf environment. t is not just the Mission Hills Club, the largest golf club in the world, that creates such a central hub for golf, there are other courses that reside in the Hainan province, some of which are also very good and well worth a visit. Most notably the Jian Lake Blue Bay Golf Club, located a 30-minute drive south of the city of Lingshui this parkland layout is a superb design by Mark Hollinger. Situated in a breath-taking landscaped enclave called Blue Bay Greentown in Lingshui, it is a stunning resort community featuring world-class resort facilities such as the world-class 18-hole championship Jian Lake Blue Bay Golf Course, golf club, commercial center and upscale properties. Kunming, known as “City of Eternal Spring”, lies at an almost-tropical latitude but its 2000 meters altitude gives it a very temperate climate with an average temperature of 16.5 ℃. 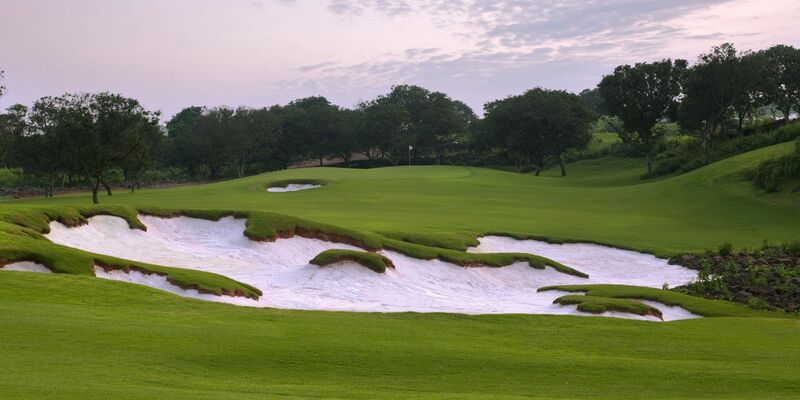 Hence, it is an awesome choice to play golf in Kunming where offer excellent golf courses, like Spring City Golf & Lake Resort, Lakeview Golf Club, Stone Forest Golf Club, with breathtaking scenery, very leisure atmosphere and luxury accommodation. Unlike golf courses in other cities, Kunming golf courses give you more than enjoyable golf experience, but sunshine, blue sky, white clouds, lake view, wild, fun, imagination, quality…so you never will forget your China Golf Trip.